A little while ago, I lamented the fact that Drew Daywalt had created such a clever story with his The Day the Crayons Quit, and I was most disappointed that I had not come up with the idea myself. This post follows the same vein. Dan Santat’s The Adventures of Beekle – The Unimaginary Friend is a wonderfully novel concept; on an island far away, imaginary friends wait to be imagined so they can start their adventures. 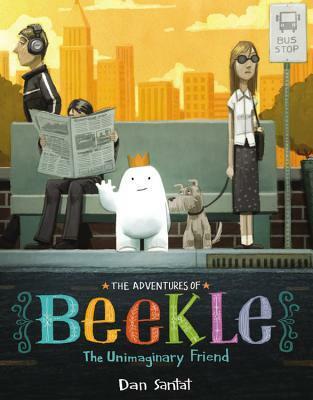 Beekle, however, is always left behind. What’s an unimagined imaginary friend to do? Santat’s story is so clever. For starters, there is lateral thought put into both the illustrations and the story. A child reading this can enjoy the surface story but, for the more developed little one, there is rewarding subtext to consider and discuss. The pictures are quirky and, at times, melancholic, but not in an off-putting way — more-so in an emotionally appropriate way. Finally, the concept is novel and makes me grumble, ‘UGH! Why didn’t I think of this?’. This story is probably most appropriate for children ages 4-7, but I’d still recommend it to kids on either end of that because…well… it’s wonderful. Go buy this story. It’s worth it. Meanwhile, I’ll sit here shaking my fist at yet another literary genius. The Adventures of Beekle the Unimaginary Friend is available at: http://www.goodreads.com/book/show/18295821-the-adventures-of-beekle.